Sharon Wright clocked 3 hrs and 9 minutes for the 26 miles and 365 yard race through the city centre. The mother-of-two placed 44th fastest women in a field of over 4,000. She was also fourth out of 751 women who were Over 35. Sharon said: “I felt like I was flying over halfway but I got a couple of stitches which meant I had to walk a little bit. “I made it to 40k and was thinking I’m not doing this ever again but I achieved 3:09:05. Slightly slower than I expected but considering the discomfort I’m very happy and it’s a 2min personal best”. “I worked through a great plan modified from last year. I’d never have reached these goals had I not been enriched with knowledge from a great coach and many others”. Asked whether she can break the magical three hour barrier, Sharon said: “It is a big ask. When you break down how much faster that is per kilometre, I am just not sure. 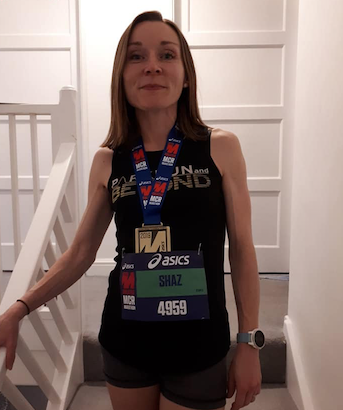 Sharon, who now competes for Harlow Ac and trains with the newly formed Parkrun and Beyond, will face her next challenge at the London Marathon on Sunday April 28th.